Black was the colour of pathos, and I was submerged in it. 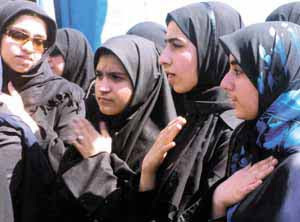 Women dressed in black sarees and salwar kameez were beating their chests to the chant of ‘Ya Hussain’. The chorus rose to a fevered pitch followed by a sudden silence. In that momentary silence was crystallized generations of mourning. The place – a Shia Muslim neighbourhood in Lucknow; the time – the tenth of Moharrum. If grief has different shades, on can see it during Moharrum. While the rest of the world greets its ‘New Year’ with celebrations, the Muslims, especially Shia Muslims, begin Moharrum, the first month of the Islamic calendar of Hijri, with mourning to commemorate the martyrdom of Imam Hussain – son of Hazrat Ali and grandson of Prophet Mohammad. Over 1300 years ago, in the desert of Karbala, in present day Iraq, Imam Hussain and his small band of relatives and supporters sacrificed their lives for Islam. History has seen numerous massacres of innocent people, but the tragedy of Karbala is one of the few where men, women and children voluntarily allowed themselves to be subjected to hunger, thirst, humiliation and death on the burning sands of Karbala because they believed that Imam Hussain stood for righteousness. Little wonder that for over 1200 years Muslims, have been nurturing the tale of Karbala in their hearts like an open wound, lest they should forget the supreme sacrifice of Imam Hussain and his followers. Great spiritual leaders are known to make great sacrifices, but at Karbala, common men and women with infants at their bosom, their hearts and souls aflame with righteousness, chose death rather than evil and weakness. Such was the greatness of Imam Hussain, such was his spiritual power, which could uplift common mortals to heights of supreme courage and sacrifice. The tragedy of Karbala took place in 680 AD on the banks of the Euphrates in Iraq but Karbala has a universal appeal and in today’s climate of violence, it is more relevant than ever. The tragedy of Karbala and its spirit of non-violent resistance and supreme sacrifice has been a source of inspiration to the likes of Mahatma Gandhi and Pandit Nehru. The former’s first Salt Satyagrah was inspired by Imam Hussain’s non violent resistance to the tyranny of Yazid. Gandhi is said to have studied the history of Islam and Imam Hussain, and was of the opinion that Islam represented not the legacy of a sword but of sacrifices of saints like Imam Hussain. Nehru considered Karbala to represent humanities strength and determination. According to the great poet Rabindranath Tagore, Hussain’s sacrifice indicates spiritual liberation. Munshi Premchand, one of India’s greatest Hindi/Urdu writers, a visionary and reformer, eulogized the tragedy of Karbala in his famous play ‘Karbala’. Premchand’s Karbala was published both in Hindi and Urdu in the 1920s. This was the time when Hindu-Muslim relations were strained and the battle between Hindi and Urdu was raging. Premchand’s Karbala was aimed at both the Hindu and Muslim audience. This play was not just Premchand’s tribute to the martyrs of Karbala but also an attempt at reconciliation of declining Hindu-Muslim relations. In his introduction, Premchand drew parallels between Karbala and Mahabharat and Ramayan. According to the prevailing conditions at the time of the commemoration, such reminiscences may become a framework for implicit dissent or explicit protest. It was, for instance, used during the Islamic Revolution of Iran , the Lebanese Civil War, the Lebanese resistance against the Israeli occupation and in the 1990s Uprising in Bahrain. Sometimes the `Ashura’ celebrations associate the memory of Al-Husayn’s martyrdom with the miserable conditions of Muslims in other non-Islamic third-world nations, on the pretense that every nation and era has their own Husayn.